This special dish makes every occassion more special. The time that family have gatherings, dishes in the table make everyone excited and happy. And the reason for everyone to come in the event, no matter what the occasion is. It is very common for us Filipinos to have gatherings.. Like us, we also do come in every occassion and event which is commonly happened in my lola's house. All of my tito's and tita's are coming including my cousins..
My tita's always come with their special dish..a surprise dish! 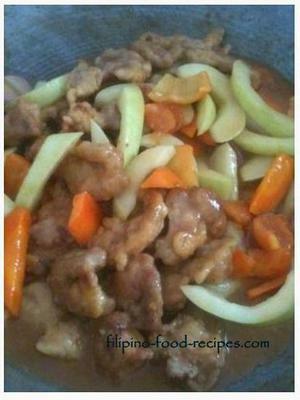 One Christmas, i used to cook "Pork Sweet and Sour" as my family's special dish contribution for the get together. 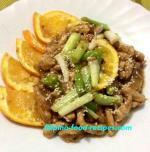 "Pork Sweet and Sour with Cucumber"
1. Pound the pork then marinate with the ingredients list above for 30mins. 2. Dust the marinated pork with flour then deep fry until brown. 3. In a mixing bowl mix all the ingredients in making Sauce. 4. In the same frying pan, saute onion and tomatoes. 5. Add the sauce mixture in frying pan. 6. Continously mix until sauce thickened. 7. Combine pork to the mixture. 8. Bring to a boil then serve.